Polyurethane which was developed many years ago during WWII as a substitute for rubber, has become very popular in recent years and is considered to be one of the most commonly used types of resinous industrial floors. This is due to its many benefits including its excellent level of protection. Polyurethane floors are solid and can be installed in many different locations such as on raised and suspended floors or old asphalt screeds. 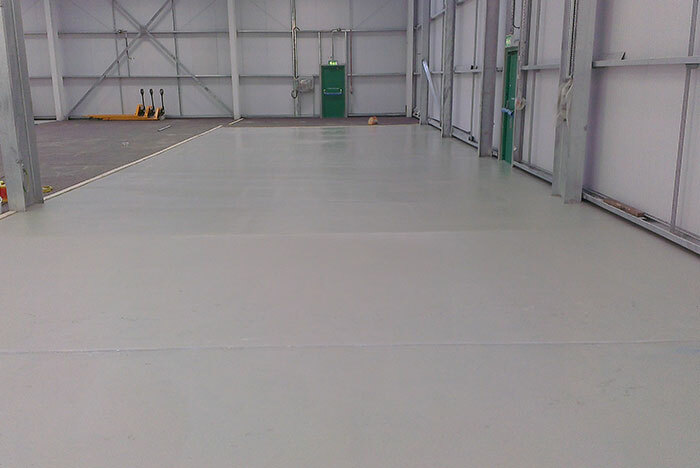 The resin flooring can be easily modified to extend or limit their pot life, recoat time and the total curing time. Polyurethane is therefore preferred in spaces with pedestrian traffic, multideck car parks, freezing chambers where the temperatures are as low as -30°C and many other situations where the benefits of Polyurethane make this type of flooring the number one choice. Polyurethane having many characteristics such as U.V stability, a high tolerance for larger temperature swings and the ability to handle humidity much better than other types of flooring. Aside from these characteristics, Polyurethane is available in different finishes from satin to very glossy. This type of flooring is regularly used within the food industry due to the level of hygiene it provides. Antimicrobial additives can be added to the resin during the application which helps to prevent bacterial growth. Polyurethanes are preferred in dairy production when food such as milk, yogurt and cheese are around as it reacts better with organic acids. There are unique benefits in the use of Polyurethane, that’s why it has become the mainstream choice in surface protection. The prime benefit of using Polyurethane is that it provides the surface itself as well as protective coating for the floor. Polyurethane is usually softer and more elastic, which makes them more resistant to scratching as their elasticity tends to absorb some of the impact. High resistance and hardness and ideal for resistance to acids. Available in a range of different finishes from satin to glossy. Do I need Polyurethane Flooring? Polyurethane can be applied to a great deal of surfaces including wood, metal and plastic and with many benefits that go along with this type of flooring, it would make an excellent overall choice. When it is installed, the coating is very effective at creating a barrier between different elements and the object it’s covering. With the type of surface that it creates, elements such as rain, dirt, mud and other types of weather related elements can be sealed out due to its impermeable barrier. As well as this type of protection, the polyurethane allows for humidity and oxidation to be prevented therefore chances of corrosion are significantly reduced. If you’re working within the manufacturing industry, then this would be your best option in terms of sealing out oil and solvents. The Polyurethane assists in noise reduction and with Polyurethane not emitting any vapours that would be harmful to people, animals or the environment, this would pose very little risk. Get in contact with us on 0151 200 1038 to speak to one of our experts directly. Alternatively, fill out our online contact form and one of our team will get back to you as soon as possible to discuss your new flooring requirements.